Key Take-Away: Iraq’s political crisis has intensified. 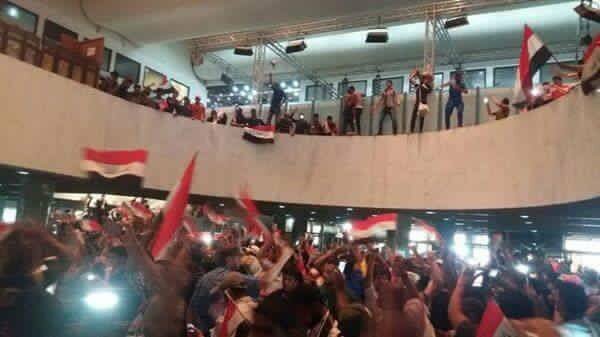 Hundreds of supporters of Muqtada al-Sadr stormed the Green Zone on April 30 and entered the Council of Representatives (CoR) building. Sadr and Sadrist Trend leaders have urged for a peaceful demonstration but have not ordered the demonstrators to leave the area, indicating that the Green Zone may see an extended sit-in. Violence is a possibility as the security forces attempt to secure Baghdad, particularly as they are already stretched thin protecting thousands of Shi’a pilgrims descending on Kadhimiyah neighborhood for the commemoration of the death of the Imam al-Kadhim, a major Shi’a holiday. ISIS will likely attempt to take advantage of the security breach by launching spectacular attacks against demonstrators and pilgrims. There is a potential threat to U.S. bases and infrastructure, though Sadr has ordered his followers not to approach any embassies. Iraq’s government is now at its most unstable, as the CoR is physically inaccessible to many members of government amid reports that Prime Minister Haidar al-Abadi and CoR Speaker Salim al-Juburi were evacuated from the Green Zone. The political crisis in Iraq is intensifying. Hundreds of supporters of Sadrist Trend leader Muqtada al-Sadr stormed the gates of the Green Zone. They forced their way into the Council of Representatives (CoR) building following the end of the scheduled CoR session. U.S. and international facilities in Baghdad are at some increasing risk, and should the situation escalate further the deteriorating security may ultimately affect some U.S. forces and basing. The UN has closed its building in the Green Zone while the Baghdad Operations Command and the U.S. Embassy have gone on alert. The safety of Iraq’s political leadership is at risk. Security forces have also evacuated Prime Minister Haidar al-Abadi and CoR Speaker Salim al-Juburi from the Green Zone, though the location to which they were evacuated is unclear. The Sadrists have begun a sit-in within the parliament and are damaging the building’s interior. At least one CoR member, Fadhila Bloc leader Ammar Tuamah, has been assaulted by Sadrist demonstrators as he attempted to leave the area. This is not the first time that Sadrist protesters have physically challenged security forces near the Green Zone. On March 18, Sadrist protesters charged Iraqi Security Forces (ISF) at the Republican Bridge en route the Green Zone, and the ISF removed the barrier to allow them to advance apparently under the order of the Baghdad Operations Command (BOC). The protesters did not, however, enter the Green Zone itself. Sadr himself conducted a sit-in himself thereafter in a tent in the Green Zone on March 27 as a continuation of the protest movement to pressure the government to conduct a cabinet reshuffle, though he ordered his supporters to remain outside of the Green Zone. The April 30th riot and assault of the CoR building appears to have been organic rather than planned. The Sadrist Trend’s leadership initially demanded that all demonstrators immediately vacate the CoR building, though they apparently later decided simply to order the sit-in in the CoR building to be conducted in a peaceful manner, a sign that the leadership may exploit the crisis. The supervisor of the Sadrist sit-in movement had coordinated with security forces for a peaceful demonstration the night before and was physically overseeing the sit-in site in front of the Green Zone when the demonstrators began storming it, suggesting but not proving that Sadrist Trend leaders did not plan to enter the Green Zone. The violence erupted after the Council of Representatives (CoR) met on April 30 to select new ministers as part of the cabinet reshuffle process. Although the CoR had successfully voted in five new technocratic cabinet ministers during the April 26 session, but the remainder of Abadi’s list has met resistance. Political blocs, including the Sunni Etihad bloc and the Kurdistan Alliance, clearly did not want to cede control over certain cabinet seats, causing deadlock in the CoR session. This prompted the members of al-Ahrar Bloc, the political wing of the Sadrist Trend, to withdraw from the session. Sadr announced a freeze of all of the Sadrist Trend’s political activity for two months, warning of the possibility of a government collapse if quotas and corruption persisted. Violence against U.S. or international installations in Baghdad. If these conditions are not met, the violence and mass street demonstrations will likely continue. Sadr could attempt to leverage the physical presence of demonstrators in the Green Zone for concessions from other political blocs and the government – he could, for example, try and start a sit-in in the Green Zone itself. His most recent orders to the demonstrators called for respecting public property and not approaching embassies in the Green Zone, but did not include an order to leave the area, indicating that Sadr may attempt to keep his followers in the area to pressure PM Abadi and the government to pass a fully technocratic cabinet reshuffle. A public sit-in in the CoR building is thus possible, which places the security forces responsible for protecting the CoR building at risk of either escalating or being over-run. While an extended Sadrist sit-in would be an escalation, attempts by the security forces to evict or shut off supplies and access to the demonstrators could spark further violence in the Green Zone that would cause security in Baghdad deteriorate to untenable levels. Even the current escalation of the crisis will likely spark intensive meetings between political bloc leaders to resume in order to find a solution to the cabinet reshuffle. The U.S. and Iran will likely intensify efforts to pressure political leaders into achieving stability. Sadr will likely participate in negotiations in some capacity but continue the suspension of the Sadrist Trend’s participation in CoR sessions, effectively suspending the CoR until further notice. The demonstration comes at an extremely dangerous time – thousands of Shi’a pilgrims are descending on Kadhimiyah in northwestern Baghdad from across Iraq for the commemoration of the Imam al-Kadhim on May 3, an event that has already prompted the security forces to shut many of Baghdad’s streets. ISIS has already launched an explosive attack southeast of Baghdad in the predominantly Shi’a al-Nahrawan area with a Vehicle-borne Improvised Explosive Device (VBIED) that reportedly killed at least 23 people and wounded 48 others. ISIS also attempted IED attacks on April 29 targeted pilgrims at a railway station but were foiled by the security forces. The demonstrations thus threaten to expose civilians to ISIS attacks and will tax the security forces to their limits. Key Take-Away: The U.S. announced additional “accelerants” in the fight against ISIS, reporting on April 18 that it would deploy 217 additional train-and-advise personnel to embed at the brigade and battalion levels with attack helicopters and an additional High-Mobility Artillery Rocket System (HIMARS). The limited increase in U.S. military support came in conjunction with an increased number of high-level U.S. military and diplomatic visits between April 8 and April 21 with Iraqi officials during its major political crisis. The Council of Representatives (CoR) split into two parallel parliaments on April 12 over a disagreement regarding Prime Minister Haidar al-Abadi’s cabinet reshuffle. Rebelling CoR members in the illegal rump parliament have attempted to oust CoR Speaker Salim al-Juburi as well as PM Abadi and President Fuad Masoum in a series of illegal CoR sessions over the past two weeks, unsuccessfully courting the Shi’a religious authorities to back them in effectively collapsing the government. However, the illegitimate parliament, which at its height reached around 150 CoR members, has suffered from defections, notably from members of the Sadrist Trend, and the rebelling CoR members have failed to reach quorum of 165 CoR members. The larger legitimate CoR, which will attempt to meet on April 26 without the members of the rump parliament, will struggle to accomplish much beyond renewing confidence in Speaker Juburi. The CoR remains divided on numerous political issues, including the cabinet reshuffle that sparked the crisis in the first place. Meanwhile, the Iraqi Security Forces (ISF) recaptured Hit District, marking an important victory and clearing a major urban center of ISIS fighters, though the town likely remains laced with a large number of Improvised Explosive Devices (IEDs). The success was dampened by a spike in ISIS spectacular attacks both north of and in Baghdad during the lead-up to the commemoration of the death of Imam Musa al-Kadhim, the 7th Shi’a Imam, during which thousands of Shi’a pilgrims visit his shrine in Kadhimiyah in northwestern Baghdad. The attacks indicate that ISIS will likely continue targeting hard and soft targets in the vicinity of Baghdad with explosive attacks during religious holidays, likely foreshadowing its intentions to spike up attacks before and during Ramadan, which begins in June 2016. Key Take-Away: The Iraqi Security Forces (ISF) and tribal fighters with Coalition air support recaptured Hit District on April 14 as part of an ongoing operation to remove ISIS from the Euphrates River Valley. Security forces began operations to connect Ramadi to Hit District on March 12 and quickly recaptured Kubaisah, west of Hit, on March 25. From there, the ISF attacked Hit from the north and west, breaching the center of Hit on April 7 and securing the district on April 14. The ISF will now work to connect Hit with al-Baghdadi Sub-District, north of Hit, along the Euphrates River by securing control over the remainder of the Haditha-Baghdad highway. Doing so will grant the ISF control over the Euphrates River Valley from Haditha to Ramadi. ISW is thus changing the Hit District and the terrain between Hit and Ramadi from ISIS control to ISF control. The Joint Operations Command, largely driven by Iranian proxy militias, launched a three-day offensive on March 1 to clear the Samarra desert from as far south as Lake Thar Thar and north towards Tikrit. The offensive concluded on March 3. Despite the difficulty of controlling desert terrain, the area has not witnessed ISIS attacks since the offensive. As such, ISW is changing key roadways from contested to ISF- and militia-controlled terrain, though ISW cannot assess with confidence if villages in the Jazeera Desert west of Samarra are under ISF and militia control. These areas thus remain contested. Popular Mobilization forces continue to clash with ISIS in the Makhoul Mountains, north of Baiji. Popular Mobilization efforts have effectively cost ISIS its unilateral control in the area, though Iraqi Shi’a militias have not succeeded in securing uncontested control over any territory north of Baiji. Therefore, ISW is changing the area from ISIS-held to contested terrain. Russian airstrikes have both repelled opposition efforts to reverse gains made by regime forces south of the city and propelled regime advances in the city’s northern industrial outskirts. Russia resumed regular strikes in the vicinity of Aleppo City on April 6 in response to an opposition offensive. This new wave of strikes in Aleppo, although not yet at the levels seen in the first five months of the Russian air campaign, ultimately places the already tenuous “cessation of hostilities” agreement at risk of collapse. 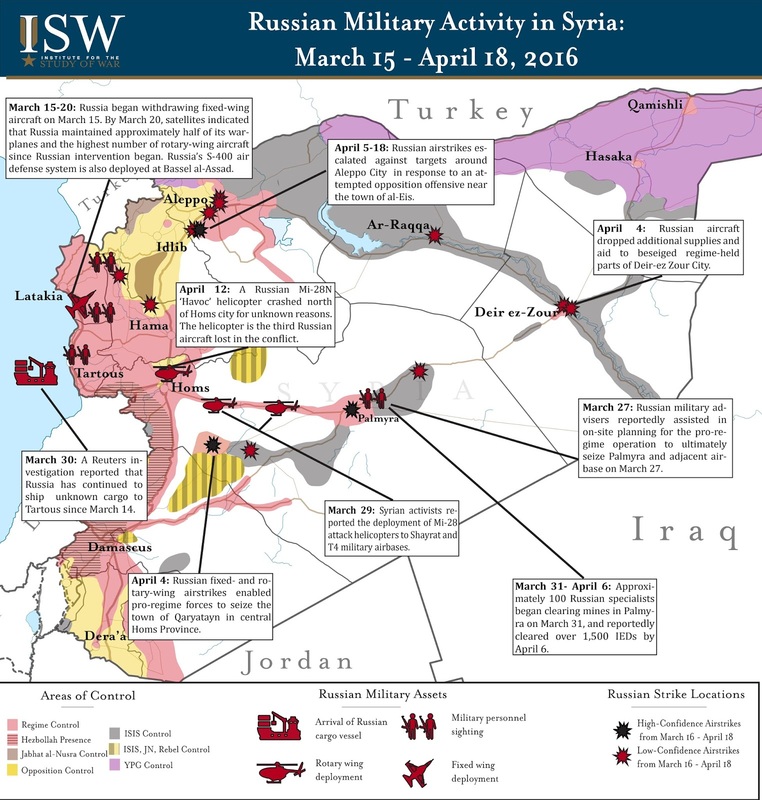 The escalation of both Russian airstrikes and pro-regime operations appears to be driving additional upticks of violence elsewhere in northwestern Syria, particularly on key regime frontlines in northeastern Latakia and northwestern Hama Provinces on April 18. Renewed opposition operations in this area apply additional pressure to the regime’s heartland on the Syrian coast. Russia has changed the shape of its deployment to meet the needs of the Syrian regime rather than scaling back its operations in theater. Russia has deployed additional installments of advanced attack helicopters in the past month, allowing Russia to carry out dynamic strikes and provide close air support in accordance with ongoing pro-regime ground operations. Activist sources reported that Russia has deployed additional rotary-wing attack aircraft to Bassel al-Assad International Airport in Latakia as well as the Shayrat, and T4 Airbases in central Homs, including installments of advanced Mi-28N ‘Havoc’ Helicopters. Advanced helicopters like the Mi-28N, which the Russian Ministry of Defense (MoD) confirmed on April 4 was in use in Syria, would be especially useful in clearing operations against the remaining ISIS-held areas of eastern Homs. Russia prioritized the regime’s front with ISIS in central Homs in March 2016, as demonstrated by the presence of Russian military advisers on the ground and the eventual deployment of de-mining personnel to clear Palmyra. While the operation achieved pro-regime objectives in securing terrain lost to ISIS in May 2015, it also allowed Russia to forward the narrative that it acts as a constructive international arbiter to the Syrian conflict and is an effective partner in the fight against terrorism while it continues to target moderate elements of the opposition on other fronts. Key Take-Away: Iraq faces a constitutional crisis that is likely to protract should its rump, parallel parliament continue to challenge the authority of the official Council of Representatives (CoR). 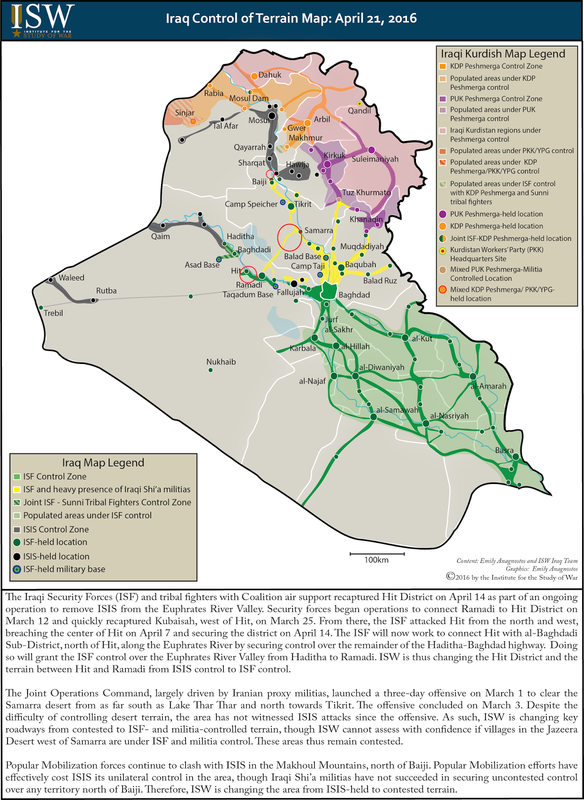 Iraq will likely face several overlapping scenarios, including efforts to dissolve the government and mass street demonstrations, in the near future that could dramatically undermine its stability and pose a threat to the U.S. campaign against ISIS. In the most dangerous scenario, the Iraqi government could collapse and set off a chain of events that leads to the selection of a pro-Iranian Prime Minister. This course of action would undermine the progress of the anti-ISIS campaign, as Iran’s strategic interest remains expelling U.S. forces from the country. Meanwhile, the instability resulting from the political crisis could lead ISIS to expand its capabilities in Iraq and launch a wave of attacks aimed at further destabilizing the country. The U.S. must take steps to mitigate the possibility of the dissolution of a government amenable to U.S. influence and the eruption of political instability that would facilitate ISIS’s expansion. The U.S. should make a concerted effort to apply diplomatic pressure to Iraq’s political blocs in order to facilitate the return to a more stable political environment under PM Abadi’s leadership. The following list represents a series of scenarios, ranging from most-likely to most-dangerous, and the risks they pose to both the stability of Iraq and the ability of the U.S. to conduct anti-ISIS operations in Iraq. Scenario: The U.S. must be prepared for a scenario in which the rump parliament attempts to remove all three presidencies – Prime Minister Haidar al-Abadi, Speaker Salim al-Juburi, and President Fuad Masoum – from their positions, as outlined in a recent ISW publication on constitutional provisions. An estimated 131 Council of Representatives (CoR) members have joined the rump parliament, already outnumbering the largest established political blocs, including the State of Law Alliance (SLA) which holds at least 40 fewer seats. If the rump parliament peels supporters away from other political blocs and builds towards the 165 seats needed to constitute a majority in the CoR, they could undermine the three presidencies and block all efforts to legislate and execute laws, though it is not entirely clear what mechanisms the CoR could use to legally remove all three presidencies. PM Abadi and his cabinet would remain in office for 30 days if the government is dissolved, though as a lame-duck Prime Minister. Risks: A collapsed government and the removal of PM Abadi could lead to the eventual reduction or expulsion of U.S. forces conducting anti-ISIS operations and participating in the advise-and-assist mission from Iraq. This scenario would have dire consequences on the Iraqi Security Forces’ (ISF) ability to conduct anti-ISIS operations and would dramatically reduce the possibility of a successful operation to recapture Ninewa Province and Mosul. Political blocs do not currently agree on a consensus candidate to replace PM Abadi, but any new Prime Minister would most likely be more pro-Iranian in leaning than supportive of the U.S. This scenario would greatly challenge the U.S.’s ability to operate freely in Iraq, as it is an Iranian strategic objective to expel the U.S. from the region. Instead, Iranian pressure could force the new Prime Minister to expel the U.S. from the country. The new pro-Iranian premier could replace U.S. and Coalition assistance with less effective and likely detrimental support from Iran and Russia, two actors that would benefit from expelling the U.S. from the region. Even if the new government did not expel the U.S., the loss of a Prime Minister welcoming of U.S. support in the anti-ISIS fight would constrain the ability of the U.S. to direct the progress of the anti-ISIS fight in Iraq. Negotiating necessary increases in support for the ISF to fight ISIS, such as additional trainers, the deployment of Joint Terminal Attack Controllers (JTACs) to coordinate airstrikes, and the construction of additional firebases to support ISF advances in northern Iraq to recapture Ninewa Province will likely be suspended for the duration a collapsed government and would be more difficult with a pro-Iranian Prime Minister. The security situation could worsen during a political crisis, as ISIS would re-focus its efforts on exploiting the situation to exacerbate the crisis further. It would likely attempt to target large popular demonstrations and could plausibly launch a wave of Suicide Vest (SVEST) or Suicide Vehicle-borne Improvised Explosive Device (SVBIED) attacks in Baghdad to plunge the Iraqi government into further disorder. Moreover, the Coalition’s progress against ISIS in both the Euphrates River Valley and in the Ninewa operations area would likely slow or even be suspended, rendering any effort to advance towards and recapture Mosul in 2016 a pipedream. Scenario: An extended period of deadlock within the CoR remains as likely as a government collapse. CoR Speaker Salim al-Juburi decided against calling a CoR session on April 16, and the rump parliament continues to negotiate with fence-sitting CoR members to join the rump parliament in a bid to oust the three presidencies. The leadership of political blocs may fail to reassert control over their rebelling members, leading to an extended period of disagreement or resorting to expelling their rebelling members from their parties, as has occurred with at least one member of the Sunni Etihad bloc. Future CoR sessions could thus be suspended and crucial votes on the government’s composition delayed further. Such a delay may extend for an unclear stretch of time, but could be cut short within a week if CoR Speaker Juburi calls for the dissolution of the CoR with the approval of PM Abadi, President Masoum, and one-third of the CoR’s members. Two parallel parliaments could thus continue in competition with one another for some time if the crisis does not reach a cresting point. Risks: A split CoR with two different Speakers paralyzes the government and will render it unable to pass legislation or votes on important processes. PM Abadi’s cabinet reshuffle process, announced on February 9 and the catalyst for the formation of the rump parliament, would be suspended, upholding Iraq’s most pressing reform program. However, a suspended government would have less of an effect on ongoing security operations, as it would leave the security branches of the government relatively untouched. Prior to the formation of the rump parliament, there was general agreement among all political blocs and PM Abadi to keep the Defense and Interior Ministers in their positions in order to minimize the effect that the political situation has on the fight against ISIS, as noted by the fact that no cabinet reshuffle proposal suggested replacing either the Defense or the Interior Minister. Political deadlock is thus unlikely to affect the U.S.’s anti-ISIS efforts in the short-term, as the impact of political deadlock on the security forces would be minimal. However, political deadlock could rapidly degenerate into government collapse if the rump parliament gains a surge in supporters or if CoR Speaker Salim al-Juburi calls for the dissolution of the CoR. Political deadlock is thus a dangerous scenario for the U.S. and threatens its ability to exert influence in Iraq as well as to direct the anti-ISIS fight. The existence of two parallel parliaments could also bring into question the legality of all legislative decisions that could result in policy paralysis and confusion among the security forces. Scenario: The ongoing political crisis has sparked a series of demonstrations and sit-ins across Baghdad and southern Iraq, primarily by supporters of Muqtada al-Sadr’s Sadrist Trend. Popular demonstrations have a mixed track record of forcing change in Iraq – the August 2015 protests hardly achieved any meaningful reforms, while Sadrist demonstrations in March 2016 were more successful, though largely because of their connection to Sadr, a major power-broker. Demonstrations are likely to grow in size in the near-term as popular and Sadrist demonstrators push the government to engage in sweeping reforms. Sit-ins in front of government buildings are also likely across southern Iraq. Supporters of Muqtada al-Sadr began setting up sit-in sites in Baghdad in Tahrir Square and in front of several government ministries while other demonstrators commenced sit-ins in several southern provinces, where they have been ongoing for at least six days. Demonstrations may vastly increase in size as Sadr gave the government 72 hours to form a government on April 16, threatening unspecified consequences that would likely involve the mass deployment of Sadr’s supporters in street protests. This scenario could be made even more dangerous if CoR Speaker Juburi, with the support of one-third of the CoR’s members, requests that PM Abadi and President Masoum dissolve the CoR in order to prevent the rump parliament from increasing in power, an option that Juburi has reportedly floated in closed-door meetings with the three presidencies. This outcome would result in the calling of early elections within 60 days, but would more importantly signify the failure of Iraq’s political leaders to accomplish any meaningful reforms. Risks: Security conditions in Iraq do not permit elections country-wide. The war against ISIS is ongoing, and much of Iraqi territory and a large segment of Iraq’s population remains outside of government control and under ISIS rule. The internal displacement of at least 3.3 million people, in addition to at least 377,000 refugees, would complicate any elections, but especially those held on short notice. Most if not all of those internally-displaced persons (IDPs) are Sunni, increasing the possibility of a sectarian, majoritarian electoral outcome that further fuels the sense of disenfranchisement that created conditions for ISIS in the first place. A call for early elections would likely coincide with a sharp uptick in street demonstrations and street violence between partisan groups over frustration with the political situation, making it a particularly risky mechanism for defusing the ongoing political crisis. Moreover, street demonstrations would be prime targets for ISIS spectacular attacks and could force the ISF to redeploy its forces away from the frontlines to Baghdad and the southern provinces in order to provide security for demonstrators; ISIS can and has attempted to target Baghdad protests with spectacular attacks. ISIS spectacular attacks are a growing threat in southern Iraq because most of the security forces intended to secure southern Iraq deployed northwards towards the frontlines with ISIS. ISIS has re-established attack capabilities in the southern provinces of Babil, Dhi Qar, and Basra, and will almost certainly attempt to target demonstrations in the South in order to compel security forces to re-deploy away from the frontlines. Demonstrations are also potential catalysts for inter-party violence, particularly between the Sadrist Trend and rival Shi’a blocs. Militias and armed supporters of various Shi’a parties could clash during demonstrations if proximate to one another, a scenario that would also require security forces to re-deploy to the area to pre-empt any other potential sources of instability from growing. Scenario: Iranian-backed Iraqi Shi’a militias have been conspicuously quiet during the cabinet reshuffle crisis, and have likely been ordered by their Iranian supervisors to keep a low profile in order to avoid creating any further instability; Iran and its proxies are presently preoccupied with operations in Syria in the Aleppo area, and likely would prefer it if the political crisis forced Iran and Iraqi Shi’a militias to delay the Aleppo operations to stabilize the political situation in Baghdad. The Iranian regime also would likely avoid popular turmoil in Iraq that could give rise to domestic, internal disorder in Iran. However, ongoing instability could cause Iraqi Shi’a militias to deploy forces to Baghdad to prepare to influence the political process and potentially deploy violence against the state or protesters. Iranian proxy militias are not the only sub-state armed groups who could take advantage of the situation. Militias loyal to Muqtada al-Sadr, including the armed elements loyal to the infamous Sadrist commander Abu Deraa, could mobilize on short notice for similar reasons and clash with rival militias. The mass deployment of Sadrist militias, historically known for a lack of discipline, could also result in Sadrist demonstrations degenerating into rioting or violence as well. Risks: The mass deployment of Iranian proxy or other militias deploying to Baghdad would increase the possibility of street violence; various militias, positioning themselves to take advantage of the political crisis, could clash as they mobilize in Baghdad’s streets or even attack protesters from rival political factions, creating a serious security issue. ISIS could exploit a breakdown in militia discipline as well and re-commence attacks against militia gatherings in Baghdad. A breakdown in security could force the ISF to re-deploy towards Baghdad in order to secure the city, and would likely delay or halt anti-ISIS operations in other parts of the country or leave parts of the country exposed to ISIS attacks. The mass deployment of militias could also fracture the ISF in a way that seriously damages or destroys the cohesion of the ISF. Extended political competition and the deployment of militias to Baghdad could accelerate efforts by political blocs to capture parts of the ISF and further undermine the ability of the central government to exert independent command and control over its own forces. Security could thus fall into the hands of militias and security forces that are more responsive to Iran than to the government. However, the likelihood of Iranian proxy militias deploying en masse to Baghdad at present is limited; one of Iran’s primary proxy militias, the Badr Organization, a group that also holds at least 23 seats in the CoR, has appealed for order and even withdrawn its members from the rump parliament in order to calm the tense political situation. Iranian proxy militias are heavily invested in fighting in Syria; a top proxy militia fighter’s recent deployment to participate in Aleppo operations is indicative of Iran and the proxy militias’ shift of focus to Syria away from Iraq’s battlefields. But an extended political crisis and security breaches could force Iran to withdraw some of its Iraqi Shi’a militias from Syria and place them in Baghdad, under the pretense of providing security, in order to re-assert militia dominance in the capital. However, this is a scenario that Iran most likely does not want to see; its primary operational effort remains operations in Aleppo, where Iran has deployed a large number of Iranian proxies as well as Iranian Revolutionary Guard Corps (IRGC) and regular forces to conduct operations against the Syrian Opposition in support of its ally Syrian President Bashar al Assad. If Iran views that the deployment of militias to Baghdad will detract from its operations in Syria and undermine stability in Iraq, it will be unlikely to order its proxy forces to congregate in force in Baghdad. Scenario: The ISF could also become involved in political violence during the political crisis. The threat would likely stem from elements of the ISF that have remained loyal to Vice President Nouri al-Maliki from his time as premier. Maliki could use loyal security forces to attempt to reassert his political position by potentially deploying violence against opposing parliamentarians or popular demonstrators. These forces could include the 56th Iraqi Army Brigade, a unique unit with a poor human rights record that is responsible for the security of the Green Zone, or the 54th IA Brigade, which, like the 56th, used to fall under the command and control of Maliki’s Office of the Commander in Chief (OCINC), as opposed the Ministry of Defense. Risks: While extremely dangerous, this scenario is also unlikely at the present. ISW has assessed that there have been no efforts by security forces inside the Green Zone or anywhere else to position themselves for any sort of coup-style operation in Baghdad. Furthermore, security forces in the Green Zone are not fully loyal to Maliki; many of them were pictured welcoming Muqtada al-Sadr, Maliki’s primary rival within the Shi’a political sphere, when he began his own sit-in in the Green Zone on March 27. Both the 54th and the 56th Brigades now fall under the command of the Prime Minister’s Special Forces Division, a formation charged with protecting the Prime Minister. PM Abadi has also reasserted control over Baghdad Operations Command (BOC), the branch of the Ministry of Defense assigned to oversee operations in the Baghdad area, by subordinating it to the Joint Operations Command (JOC), run by a professional military commander responsive to PM Abadi. Pressure from Sadr was crucial in convincing BOC and Baghdad-based security forces to allow Sadrist demonstrators to converge on the Green Zone on March 18, indicating that PM Abadi and the JOC still does not exert full control over the behavior of the security forces. Nevertheless, strengthened Defense Ministry control over the security forces in Baghdad renders the possibility of Maliki-linked security forces from engaging in political violence unlikely. Scenario: A more likely method for former Prime Minister Nouri al-Maliki to reassert his political power is through the judiciary, headed by a long-time ally, Judge Medhat Mahmoud. Maliki previously used the judiciary to for his own political ends, including the disqualification of Sunni candidates from the rival Iraqi List in the 2010 parliamentary elections in order to secure the premiership. It is possible that Maliki could devise some method of facilitating the overthrow of the government through a constitutional ruling from Mahmoud, particularly in the event of a protracted constitutional crisis. Risks: Maliki’s ability to channel popular frustration with the government is extremely limited at present, not least because Iran, his main external supporter, quashed his most recent attempt to oust PM Abadi in late March/early April 2016. Furthermore, while Maliki has voiced support for the rump parliament demanding the dissolution of the government, he is unlikely able to exert significant control over the rebelling CoR members, despite the presence of Maliki stalwarts like Aliyah Nassif and Hanan al-Fatlawi in the rump parliament. Other rebelling CoR members include members of the Sadrist Trend, the secular Wataniya Bloc, and the Sunni Etihad bloc, groups that are unlikely to align themselves with Maliki on any issue. Thousands of Sadrist Trend supporters are currently demonstrating across Iraq with explicitly anti-Maliki iconography and messages, and Sadr himself issued a blistering condemnation of Maliki during a speech on April 16. The Sadrist Trend’s overall aversion to Malik renders it unlikely that the Sadrist Trend’s political representatives would publicly align with Maliki in any meaningful way. Maliki is more likely attempting to steer the direction of the rump parliament without enjoying direct control. Wataniya Bloc leader Iyad Allawi likely faces the same situation, as he is participating in the rump parliament but also strongly opposes Maliki. Allawi and Maliki likely are not cooperating, however. Both seek to take advantage of the moment in a bid to increase their individual political statures. 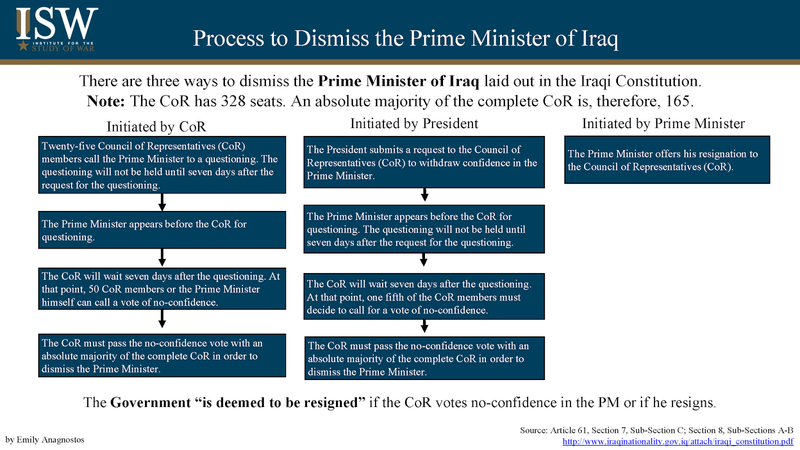 Scenario: Maliki’s allies, Allawi, and other participants in the rump parliament are attempting to peel CoR members away from the political blocs’ leadership and convince them to join the rump parliament; they have already achieved some success with attracting defectors from the Sunni Etihad bloc. However, political blocs are also attempting to reassert control over their rebelling CoR members. The longer the rump parliament meets, the greater the risk of old political differences, namely between Maliki supporters and members of al-Ahrar and Wataniya Blocs, bubbling to the surface and undermining cohesion and cooperation among the rebelling CoR members. Political blocs could begin re-absorbing their members from the rump parliament back under the leadership and discipline of the bloc leaders over the next several days. Risks: The issues that existed prior to the formation of the rump parliament will remain even if the rump parliament fails and the political blocs reassert control over the CoR. Political blocs will still need to vote on a new cabinet and decide its composition, and the question of whether or not to keep PM Abadi in his position will continue to be a point of contention among political blocs. If the political blocs quash the rump parliament, then PM Abadi’s position will remain endangered. The political blocs could still vote to oust PM Abadi or collapse the government in a bid to introduce change in the government, a scenario that could even lead to the expulsion of the U.S. from Iraq. Political blocs reasserting control over their rebelling members will still leave open the major questions that are leading to instability in the Iraqi government and continue to pose a threat to U.S. interests. Unless the political blocs can agree both on how to proceed with PM Abadi’s reform program and to leave PM Abadi in his position, then marginalizing the rump parliament will fail to lead to any change in the cabinet or the completion of any genuine reforms. The U.S. must engage in an intense diplomatic effort to prevent the collapse of the government and to strengthen PM Abadi in the face of his enormous challenge. The U.S. has already doubled down on efforts to publicly support PM Abadi, including visits to Iraq within the past two weeks from a Congressional delegation, U.S. Special Envoy Brett McGurk, U.S. Ambassador Stuart Jones, CENTCOM commander Gen. Joseph Votel, and U.S. Secretary of State John Kerry, as well as phone calls from U.S. Vice President Joe Biden. But the continuous diplomatic outreach should also extend to the leaders of all political blocs, not just PM Abadi and the three presidencies, to coordinate an effort to preserve the current government and form a consensus agreement between political bloc leaders to stabilize the political situation. The U.S. must also prepare for the possibility that security in Baghdad could rapidly collapse amid street demonstrations, inter-militia violence, clashing of various actors with the security forces, and a wave of ISIS spectacular attacks aimed at exacerbating the crisis. But there are few kinetic options available to the U.S. that could stabilize the situation. The U.S. only has the capacity to protect U.S. personnel and assets in Baghdad. However, the U.S. must be prepared to continue with anti-ISIS operations in a potential power vacuum and work with the security forces to introduce additional U.S.capabilities as needed to maintain momentum in recapturing territory. Additional capabilities, such as additional firebases, the deployment of additional advise-and-assist personnel, and the deployment of JTACs to Iraq are potential options available to the U.S. to expedite the ISF’s progress in recapturing territory from ISIS. The U.S. must exert as much diplomatic pressure at its disposal in order to stabilize the political situation and support PM Abadi. The U.S. must minimize the possibility of a government collapse that could lead to the nomination of a pro-Iranian premier and the consequent possibility of the new Iraqi government reducing or even expelling U.S. forces from the country. In doing so, the U.S. must ensure that all options for supporting Iraq in the fight against ISIS remain open and that the political crisis does not reverse or damage the progress of the fight against ISIS. Iraq's political crisis is cresting to a point where the collapse of the government is a distinct possibility. Iraq's political blocs have begun to split, with some members calling for the dissolution of the government and others insistent on replacing the cabinet as part of a protracted cabinet reshuffle process initiated on February 9. Major reforms in the government must be done in accordance with the Iraqi Constitution, which lays out how and by whom certain actions may be taken with regard to dismissing the Prime Minister, various Cabinet ministers, the Council of Representatives (CoR), etc. This week, Iraqi Parliamentarians use the justification of a non-existent “quorum” – a majority of the CoR – to convene an illegal session, dismiss the Speaker of the CoR, and elect a new Speaker. All this was done under the alleged mantle of Constitutional legitimacy. The document below examines and excerpts the relevant sections of the Iraqi Constitution related to the powers to dismiss and/or dissolve the various bodies and positions in the Iraqi government. This information is not intended to be a predictor of what will come nor a guide for action, but rather an information source so that when claims are made about the legality and Constitutionality of certain actions by any actor, you will be able to judge those statements for yourself. Click on the image below to read the full document. 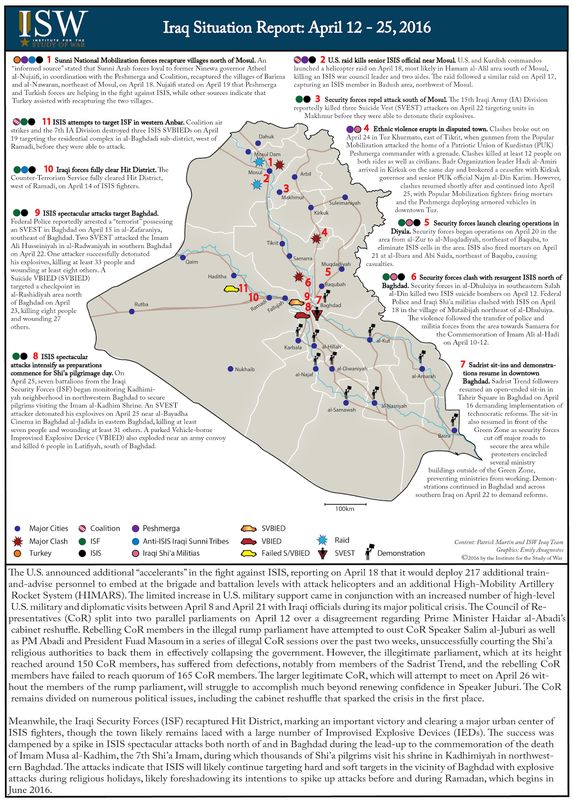 ISW's timeline presents the major meetings and events leading to Iraq's current political crisis. Spanning 7 weeks, this timeline details nearly 70 individual meetings related to the political crisis precipitated by Prime Minister Abadi’s announcement of an impending Cabinet shuffle. The meetings demonstrate the level of negotiations between international and regional actors and Iraq’s major political blocs to find a solution to Iraq’s ongoing political crisis. Read a detailed analysis of the current political crisis by the ISW Iraq Team led by Patrick Martin here. Key Take-away: Iraq Prime Minister Haidar al Abadi faces new calls for his resignation as a rump parliament of roughly 131 members, falsely claiming a quorum, has begun to ouster its sitting leaders. The rump Council of Representatives (CoR) barricaded itself in the Parliament building after an overnight sit in on April 13 to 14. The parliamentary remnant illegally convened a session, voted amongst itself to dismiss CoR Speaker Salim al-Juburi, and elected a new provisional speaker. Party discipline and cohesion is devolving, though the Kurdistan Alliance, ISCI, and Badr Organization – each of which has received benefits in the evolving cabinet reshuffle – appear to have retained control of their members. Senior political leaders are meeting. Longtime allies Ammar al-Hakim and Jalal Talabani met in Suleimaniyah on April 13, presumably to discuss ISCI cooperation with the Kurdish Alliance, while rumors state that Muqtada Sadr is in Lebanon, as is Jawad al-Sharistani, the son-in-law and representative of Grand Ayatollah Ali al-Sistani. Although these leaders may be trying to stave off government collapse, they may not be able to overcome the parliamentary entropy. Street protests have reignited in advance of Friday prayers. Parliamentary means, protests, or force may topple the current government. Prime Minister Abadi’s cabinet reshuffle has floundered as political blocs hijacked the initiative in a bid to preserve their representation and access to patronage within the cabinet. PM Abadi announced the cabinet reshuffle on February 9 in an effort to improve government performance, remove political interests from the cabinet, and reassert control over the government. ISW assessed on February 15 that PM Abadi’s attempt to reshuffle the cabinet might lead to his ouster. Abadi’s efforts this spring have largely failed, as they did in August 2015. Members of political blocs, including Former Prime Minister Nouri al-Maliki’s State of Law Alliance (SLA), have more openly discussed whether PM Abadi should remain premier. Others, primarily those that are opposed to SLA leader Nouri al-Maliki, have insisted that PM Abadi cancel his membership in the Dawa Party, nominally to have an “independent” Prime Minister, but actually in order to pry PM Abadi away from Maliki and his grip on the Dawa Party. Meanwhile, Maliki and pro-Iranian elements within the pan-Shi’a political body, the National Alliance, worked to prevent PM Abadi from conducting any meaningful reforms. Most notably, the National Alliance formed a unique sub-committee on March 27 composed of a senior ISCI member, Hamid Maleh, and two Iranian proxy actors, Badr Organization leader Hadi al-Amiri and Popular Mobilization Commission chairman Faleh al-Fayadh. Maliki and pro-Iranian elements likely wanted to control the direction of PM Abadi’s reforms, while ISCI’s representation was likely more a product of its fence-sitting position as it attempts to re-position itself as a more powerful force within Iraqi politics, as outlined in ISW’s March 25 assessment. Iraq’s political situation has degenerated spectacularly. Political blocs have been unable to select a new cabinet despite weeks of negotiations and horse-trading, leading to frustration not just among the Iraqi populace, but within the political blocs themselves. On April 12, several political blocs fractured as CoR members rebelled against the apparent wishes of their respective leaders, barricading themselves within the CoR building, forming a rump CoR, and illegally voting a new CoR Speaker to replace current Speaker Salim al-Juburi. The situation has degenerated to the point that party discipline among a large number of political blocs has collapsed, with rebelling CoR members taking positions dramatically different from those of their bloc leaders. The current political crisis threatens the stability of Iraq in an unprecedented manner, and the crisis could see the government collapse. PM Abadi’s reform initiative has benefited from the support of Sadrist Trend leader Muqtada al-Sadr, who has positioned himself as the head of a popular anti-corruption and pro-reform movement in the wake of Grand Ayatollah Ali al-Sistani’s withdrawal from Iraq’s political scene in early February. Sadr’s support has come largely in the form of popular street demonstrations and a large sit-in organized in front of the entrance to the Green Zone in central Baghdad. Thousands of Sadrist supporters have called for reforms, and Sadr himself even joined the sit-in movement, setting up a tent in the Green Zone on March 27 to pressure the political blocs to conduct reforms and select a new cabinet of technocrats. Sadr’s personal sit-in put heavy pressure on the political blocs to acquiesce to PM Abadi’s demands to select a new cabinet to PM Abadi’s specifications. PM Abadi, bolstered by Sadrist Trend leader Muqtada al-Sadr and large demonstrations in favor of reform, sent a list of potential replacements for his cabinet to the CoR on March 31. In defiance of Maliki and the preferences of pro-Iranian interests, the list was almost entirely composed of technocrats and had no major political party members represented. The only exceptions were Defense Minister Khalid al-Obeidi, a member of the Sunni Etihad bloc, and Interior Minister Muhammad al-Ghabban, a member of the Badr Organization, citing the need to maintain stability in these ministries due to the ongoing fight against ISIS. Cleverly, the technocrats included independent Kurds as nominees for the important Oil and Housing Ministries in a bid to win the support of the Kurdistan Alliance. The Kurdish blocs had previously insisted on the need for current Kurdish ministers to retain their positions in order to preserve Kurdish representation within the government. While presenting the list at the CoR, PM Abadi deliberately thanked Sadr, who ended the pro-reform sit-in his followers had been conducting in front of the Green Zone since March 18, even though Sadr did warn that he would withdraw confidence from if the cabinet reshuffle did not succeed. PM Abadi likewise noted that the CoR needed to vote on the new cabinet within 10 days, though at some point, the voting session was delayed two additional days to April 12 for unclear reasons. Multiple parties opposed the new cabinet that cut them out of government. Sunni blocs complained that the new cabinet was not representative of the people. The Kurdistan Alliance had insisted on the need for the Kurdish blocs to be consulted before any Kurd was nominated, but later simply resorted to intimidation to force the Kurdish technocrats to withdraw their nominations in a bid to force PM Abadi to keep the current Kurdish ministers in the government. ISCI, on the other hand, recommended a “National Reform Initiative” aimed at building an advisory council to PM Abadi composed of the leaders of all major political blocs, as well as a committee representative of the political blocs to advise PM Abadi on the new cabinet’s composition. The ISCI meeting formed the basis for future efforts by political blocs to come to a consensus agreement on how to approach the reform process, as it effectively recommended a cross-party power-sharing agreement within the government and constraints on PM Abadi’s powers. The cabinet reshuffle process also sparked a flurry of meetings between political bloc leaders as they attempted to find a solution to the protracting political crisis. The meetings were not just among political allies, but among prospective allies as well; ISCI’s Ammar al-Hakim met with Badr Organization, Etihad members met with al-Ahrar Bloc members, and all blocs met with some combination of the three presidencies: Prime Minister Haidar al-Abadi, President Fuad Masoum, and CoR Speaker Salim al-Juburi. These meetings were likely conducted for the primary purpose of negotiating the outcome that would bring the most benefit to the political blocs. Political pressure eventually led PM Abadi to retreat, and he invited political blocs to submit their own technocratic nominations for consideration. Political blocs inevitably submitted new political candidates for the technocratic cabinet, though not all party members accepted their nominations, indicating that party discipline was breaking down. One member of the Sunni bloc Iraqiyya Alliance, Qutaiba al-Juburi, stated he withdrew his nomination after Iraqiyya selected him for a ministerial position, citing the need to have a non-partisan cabinet. The Kurdistan Alliance did not even bother to submit nominations and remained the strongest opponents of the concept of the cabinet reshuffle, insisting that their current ministers retain their positions. Yet going into the April 12 CoR session, the political blocs and the three presidencies appeared to have an agreement with one another, even signing a document on April 11 laying out the framework for a national reform initiative similar to the ISCI reform initiative, laying out the cabinet reshuffle process, and identifying key legislation that needed to pass in the CoR. They even appeared to agree to preserve political interests in the cabinet; they reportedly agreed to do away with the March 31 nominations and keep 22 ministries instead of the proposed 16 in an attempt to ensure that all blocs had representation – and thus, access to patronage – in the cabinet. This contrasted with the weeks leading up to the March 31 CoR session that saw different political blocs leaking different lists of cabinet members to the media in a bid to influence the direction of the reform process. However, several unspecified blocs reportedly boycotted the meeting. The leader of the SLA, Vice President Nouri al-Maliki, attempted to oust PM Abadi. The U.S. and Iran were meanwhile applying leverage to ensure that PM Abadi did not leave office. U.S. support for PM Abadi during the reshuffle has been particularly strong and visible; U.S. officials, including Secretary of State John Kerry, met with the leaders of numerous political blocs in Iraq on April 8, and U.S. Vice President even phoned PM Abadi multiple times to express his support. The U.S. reached out to political blocs, including ISCI and the Kurdistan Democratic Party (KDP), to discourage any attempt to remove PM Abadi. For the U.S., retaining PM Abadi in his position is critical for maintaining ongoing anti-ISIS efforts. PM Abadi willfully accepts U.S. and Coalition assistance as far as is possible without sparking the ire of Iran and its proxies. He also actively resists pressure to conform to Iranian directives, albeit weakly. More importantly, there are no obvious candidates to replace PM Abadi should he leave the premiership for any reason, and a political crisis stemming from a collapsed government could severely undermine anti-ISIS efforts, reversing progress and allowing ISIS to take advantage of the unrest to re-establish its capabilities and launch attacks. Iran also blocked efforts to oust PM Abadi, reportedly sending its top regional power-broker, Iranian Revolutionary Guard Corps (IRGC)-Quds Force commander Qassim Suleimani to rein in Maliki’s initiative. For Iran, keeping PM Abadi maintains stability at a time when it is preoccupied with events in Syria. Iran may also benefit from Abadi’s weakness, which allows it to maintain its status as a powerbroker among Iraq’s Shi’a factions. Maliki, in contrast, is a centralizer and consolidator of power. Finally, the Iraqis may not be able to push a more pro-Iranian premier through the confirmation process. It is not clear when Maliki attempted to replace PM Abadi, and it is unclear whether or not Maliki attempted to replace PM Abadi before or after the March 31 CoR session that saw PM Abadi submit his list of technocratic nominations. But Maliki’s attempt to remove PM Abadi, and the cabinet’s change from a technocratic one to one of political party interests, demonstrated PM Abadi’s vulnerability and his inability to impose his will on the political blocs. The crisis over the cabinet reshuffle escalated even further on April 12, when PM Abadi submitted his new list of nominations to the CoR for a vote. The new list was a compromise between PM Abadi’s March 31 list, which consisted entirely of technocrats, and the appointments of political blocs. The April 12 list recommended that: four of the original 16 nominated technocrats stay in the new cabinet; a number of new technocrats take other positions; and that the Interior and Defense positions remain untouched due to their importance in the ongoing fight against ISIS. Yet the new cabinet also retained a number of senior political actors. The Kurdistan Alliance had collectively threatened to boycott the CoR session or even withdraw from government if their ministers did not remain in their current positions, so PM Abadi had to concede positions to the bloc in order to secure their votes. Current Culture Minister Fariyad Muhammad Rawanduzi and Finance Minister Hoshyar Zebari therefore kept their positions, and a third position, the Migration Ministry, went to a PUK member. The new list also recommended Faleh al-Fayadh, the National Security Adviser and the Chairman of the Popular Mobilization Committee (PMC), as the new Foreign Minister. Fayadh, a figure who is close to both Maliki and Iran, is the polar opposite of a technocrat, and was likely pushed on PM Abadi by Maliki. The new cabinet thus represented a step back from the March 31 list that sought to remove political interests from government. It is not clear if PM Abadi ever wanted to submit the April 12 list; an anonymous source “close to PM Abadi” stated that PM Abadi submitted both the April 12 compromise list and re-submitted the March 31 technocrats list, but that somehow only the April 12 list was brought to a vote. The April 12 CoR session represented a flurry of confusion and delay tactics. Speaker Juburi stated that PM Abadi needed to submit either the resignations or the notifications of dismissal for the current ministers before the new ministers could be selected, likely in an attempt to delay the vote, though CoR members called for the new list regardless. The CoR session briefly adjourned, and PM Abadi, Speaker Juburi, and the heads of political blocs met in private to discuss the reform process. The blocs could not come to an agreement on the new cabinet, and so Speaker Juburi, after reconvening the CoR session, announced that the vote would be delayed until April 14. Juburi’s announcement led to mayhem in the CoR. Members swarmed the Speaker’s podium, yelling and chanting against political quotas and protesting the delay. One outraged CoR member even threw several chairs at the podium. In a bizarre spectacle, several CoR members staged a farcical vote and half-jokingly selected a new CoR Speaker, a senior SLA member from Babil Province, as well as a Speaker’s deputy and rapporteur. Shortly thereafter, protesting members of the SLA, Etihad, and al-Ahrar barricaded themselves inside of the CoR building and announced a sit-in inside the CoR hall to force an emergency CoR session to convene on April 13. Some protesters also called for the CoR to vote on the original technocratic list instead of the April 12 compromise nominations. An al-Ahrar member stated that 115 CoR members, including 40 female members, stayed in the CoR overnight in protest. One of the other demands of the protesters was the removal of the three presidencies from their positions and the dissolution of government. Shortly before PM Abadi presented the list of new nominations, a movement began within the CoR to collect signatures for the removal of the three presidencies. Ahmed al-Juburi, a member of the Iraq Alliance, a primarily Sunni bloc, stated during the CoR session that 33 CoR members had signed a document calling for the removal of the three presidencies and the dissolution of the government for failing to meet the demands of the people and dragging the country into a “spiral of crises.” Throughout the course of the day, the number of signatures fluctuated from anywhere from 105 and 114 to 150 and 164. The sit-in and protest appeared to be less of an initiative organized by political blocs’ leadership and more of an emotional response to the crisis. 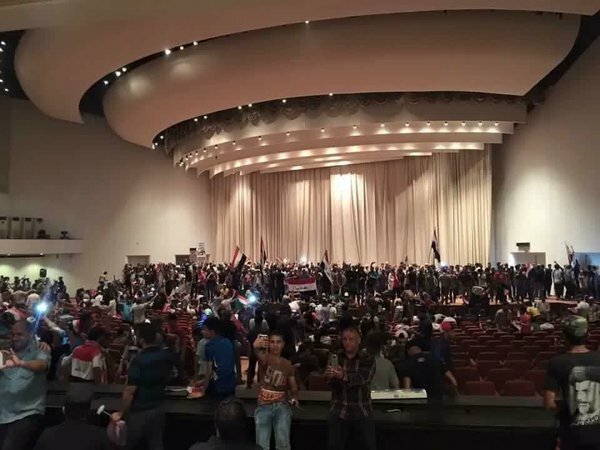 There did not appear to be any one bloc that showed up in their entirety to the CoR sit-in, which saw several competitors sitting in solidarity with one another; Hakim al-Zamili, a senior member of the Sadrist Trend, and members of al-Ahrar Bloc sat next to Aliyah Nassif, a key ally of Maliki, Sadr’s primary rival, as well as Hassan Salim, a CoR member affiliated with the Iranian proxy militia Asa’ib Ahl al-Haq, a rival of Sadrist militias. Similarly, members of other blocs, such as the Kurdistan Alliance and ISCI, did not appear to participate in the sit-in. This indicates that these blocs maintained party discipline and stuck with the directives of the political blocs’ leadership, which likely agreed to delay the CoR vote. Discipline broke down in other blocs. The leadership of the political blocs, if they commented at all, voiced disapproval of the CoR protest. The Sunni Mutahidun party condemned efforts to undermine procedure in the CoR, though members appeared to participate in the sit-in. 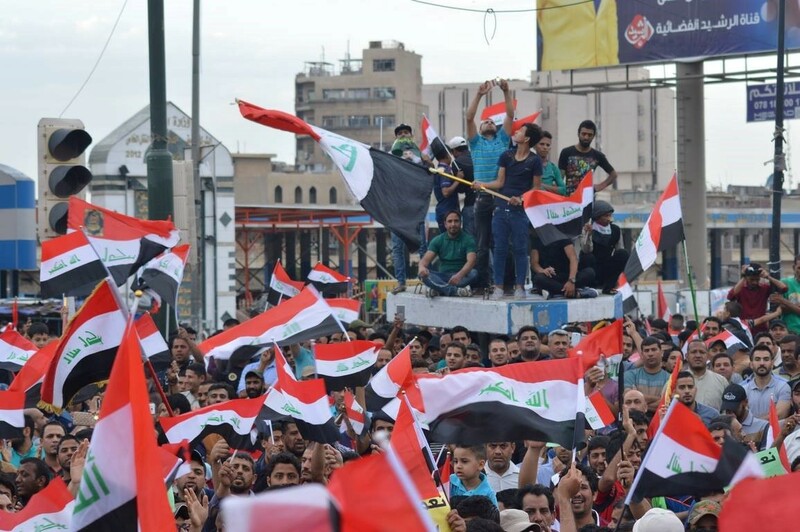 While Sadrist Trend members participanted in the CoR sit-in, members of a Sadrist demonstration that reached into the thousands occurring in Tahrir Square on the same day shied away from supporting the prospect of removing the three presidencies. The overnight sit-in forced Speaker Juburi to call an emergency CoR session to vote on the new cabinet on April 13. He reportedly planned to present both the March 31 and the April 12 list to the CoR for voting. Only 174 CoR members were present – barely over a quorum, which requires 163. However, no vote could be held as the CoR again fell into chaos. 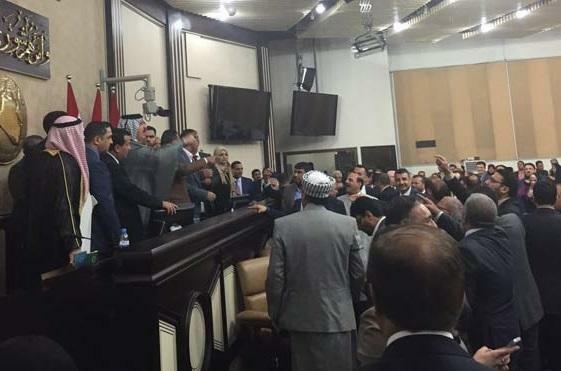 An al-Ahrar Bloc member, Awad al-Awadi, demanded at this point that Speaker Juburi “act with courage” and present the motion to dismiss the three presidencies, reportedly signed by 171 CoR members, after which CoR members began chanting for Speaker Juburi’s removal. At some point, a physical altercation between Aliyah Nassif and PUK member Ila Talabani broke out – reportedly because Nassif was sitting in Talabani’s chair – that led to CoR members to throw punches and bottles of water at each other. The chaos led Juburi to suspend the April 13 CoR session, though CoR members continued to protest inside of the CoR building. Speaker Juburi, in a bid to end the demonstration, went to President Masoum and recommended that he dissolve the CoR and call for early elections. The move represented a bid by Speaker Juburi to re-impose discipline in the CoR and – it would have been highly unlikely for Iraq to be able to conduct any elections given the security environment. Speaker Juburi also met with political bloc leaders and with PM Abadi to discuss the ongoing crisis. The CoR protest movement was bolstered even further when Iyad Allawi, the leader of the secular Wataniya Bloc, joined the protesters in the CoR building. Allawi has been one of PM Abadi’s strongest critics, and has called for PM Abadi’s removal on numerous occasions in the past. Allawi likely joined the demonstrators in a bid to boost his political stature, as he has declined as a relevant political figure in recent years, going from nearly capturing the premiership in 2010 to holding only 21 CoR seats today. It thus appears that Wataniya and al-Ahrar are the two blocs that have wholly joined the CoR protesters, as these are the only two blocs whose senior leaders have participated in the CoR sit-in. Events came to a head when, on April 14, Speaker Juauri did not attend the CoR to call for its scheduled session. Neither did PM Abadi nor President Masoum, who were supposed to attend, nor, for that matter, members of political blocs who had not joined the protest movement. The notable absences indicate that the political bloc leaders and the three presidencies decided to delay the CoR session until they could re-impose discipline on the protesting CoR members. Political blocs, who had been attempting to preserve their interests within the new cabinet, were losing control over their ability to insert political candidates into the new cabinet, as the rebelling members of their own blocs had begun actively resisting partisan nominations and were actively calling for a technocratic government and new political leadership. The leadership of the political blocs were thus confronted with the problem of a cohesive protest movement working against their own parties’ interests and threatening the stability of the government. The biggest problem was that the rebelling CoR members were acting as a single bloc, larger than any other in the CoR by at least 40 seats and taking up more than a third of the CoR’s seats, making them the most powerful force in CoR decision-making. The April 14 CoR session thus did not reach quorum – according to the Parliamentary Media Directorate, only 131 rump CoR members were present, below the 163 members necessary for quorum. This number was not confirmable, particularly because security forces prevented the Parliamentary Media Directorate employees from entering the building for an unspecified reason. The lack of quorum did not stop the rebel CoR members from holding an illegal session under the chairmanship of Adnan al-Janabi, a leader in a prominent Sunni tribe in Babil Province and a member of Iyad Allawi’s Wataniya, who stated that 171 members attended the session, enough for quorum. Another CoR member, SLA member Kadhim al-Sayyadi – an unhinged SLA member best known for attempting to shoot another CoR member during a television interview in November 2015 –stated that the April 14 CoR session was a continuation of the previous day’s CoR session, and that because quorum was reached in the previous day’s CoR session, the April 14 session was legal. It is most likely that quorum was not reached. The CoR members effectively formed a rump parliament, a parallel CoR with shrunken membership, and upended the sitting leadership of the properly elected and constituted CoR. They voted to remove Speaker Juburi, First Deputy Humam Hamoudi of ISCI, and Second Deputy Aram Sheikh Muhammad of the Kurdistan Alliance, according to their spokesperson, Haitham al-Juburi, a member of a small party within the SLA. The rebelling CoR members unanimously selected Wataniya member Adnan al-Janabi as interim CoR Speaker. They also formed a committee of three unspecified people to select a new CoR Speaker for the April 16 CoR session. The parallel CoR insisted that it was formed without political party interference. All of the CoR members participating in the rump parliament – a term referring to a parliament that exists parallel to the legal parliament but also composed of legal parliament members – are members of political blocs, and are therefore making a deliberate break with their parties’ leadership. They are attempting to form a new political bloc. A rebel Etihad member, Ahmed Jarba Mutlak, demanded that President Masoum withdraw confidence from PM Abadi, a move that would collapse the government. Masoum would thus, in accordance with the constitution, need to give the right to form a new government to the largest bloc. Jarba noted that the largest bloc was composed of rebelling members of the rump. This indicates that there are efforts to coalesce the rebelling CoR members into a cohesive political force at odds with the leadership of the political blocs. According to Wataniya Bloc chairman Hassan Chuwairid, a participant in the CoR protest, the rebelling CoR members would even hold talks with other blocs to choose the new Speaker. The backlash from the political blocs against the attempt to oust Speaker Juburi was swift. The Speaker stated that the session was not legitimate as no quorum had been reached. The Kurdistan Alliance and Etihad, of which Speaker Juburi is a member, also rejected the motion as unconstitutional, though the Etihad CoR Bloc chairman, Ahmed al-Masari, continued to insist on the need to question PM Abadi and sack him if necessary. The leader of Badr Organization’s CoR bloc, Qassim al-Araji, called for the need to maintain “social cohesion” and warned that “significant differences” between political blocs could result in a degenerating security situation. The prospect of a collapse in government unnerves the regime in Iran, and the position of the Badr Organization, an Iranian proxy group, is indicative of Iran’s unease about Iraq’s political crisis. Though PM Abadi is unpalatable to Iran due to his willingness to accept large amounts of U.S. support in the fight against ISIS and his unwillingness to willingly bow to Iranian directives, Iran presently favors stability in Iraq over a change in government, in large part because Iranian military forces and its Iraqi proxy militias are preoccupied with fighting in Syria. It is also possible that Muqtada al-Sadr has become unnerved by the direction of events. Sadr publicly distanced himself from al-Ahrar Bloc during his sermon in Tahrir Square on February 26, even referring two of its most senior members for investigation on corruption charges and detaining another. The Sadrist sit-in in front of the Green Zone was marked by a lack of participation by al-Ahrar Bloc members and a reliance on Sadr’s charitable foundation, the Office of the First Martyr al-Sadr, a further indication of separation between Sadr and al-Ahrar. It is thus possible that Sadr has lost control over al-Ahrar Bloc, as he has conspicuously issued no statement in support of the rebelling CoR members, despite the prominent participation of al-Ahrar Bloc members in the protest. It is important to note that Sadr did warn that he would withdraw confidence from PM Abadi on March 31 if the cabinet reshuffle did not succeed. However, Sadr’s behavior indicates that al-Ahrar Bloc may have misinterpreted or gone against Sadr’s orders in some measure; al-Ahrar Bloc in all likelihood remains loyal to Sadr, but may not necessarily be under Sadr’s full control. Much of the Shi’a political establishment will seek stability, as will the Iranian regime. Iraq’s most prominent Shi’a powers are thus likely seeking a way to defuse the situation before the government collapses. On April 13, an anonymous political source stated that Sadr arrived in Beirut on an “unofficial visit,” reportedly to “consult” with Lebanese Hezbollah leader Hassan Nasrallah. Sadr reportedly joined SLA leader Nouri al-Maliki, Sadr’s rival, who had arrived in Beirut on April 11. In addition, their meeting coincided with a visit to Lebanon by Jawad al-Shahristani, the representative and son-in-law of Iraq’s highest Shi’a religious authority, Grand Ayatollah Ali al-Sistani, who led a delegation to Lebanon on April 14. There is no confirmation that these figures met, either separately or all together, but it is highly unlikely that these arrivals were coincidental. It is more likely that Iraq’s major Shi’a powers arrived in Beirut to discuss a way to address the crisis in Iraq, possibly with Nasrallah or a representative of the Iranian regime, such as IRGC – Quds Force leader Qassim Suleimani Iran’s favorite power-broker for the region. Iraq’s political crisis has reached a dangerous threshold – political blocs still have not reached an agreement on the new cabinet and are experiencing internal fracturing. The result could be a collapse of the Iraqi government: the CoR could vote no-confidence in PM Abadi or he could resign. The CoR could lose a quorum and cease to function as it did in 2006. The rump CoR could persist and create a parallel government. A judicial challenge to the constitutional crisis that ensues would likely favor Maliki, as long as Medhat Mahmoud, the head of the Judiciary and a longtime Maliki ally, remains. CoR Speaker could also dissolve the CoR and call for early elections at the threat of facing mounting protests and instability across the country. Any of these prospects practically ensures that there will be no possibility of recapturing Mosul in 2016. The consequences of Abadi’s fall or a constitutional crisis could be disastrous for the stability of the country. Ongoing street demonstrations and confusion surrounding the process of selecting a new government could expose the country to attacks by ISIS aimed at further exacerbating the situation. The security situation could worsen as Iraqi Shi’a militias descend on Baghdad in a bid to influence the political climate, an outcome that could increase the possibility of intra-political party violence in Baghdad. Alternatively, formal institutions of the Iraqi Security Forces could become involved, although ISW has observed no such indicators as of April 14. Iraq’s Kurds could take concrete steps towards secession if efforts to form a new government exclude Kurdish blocs. The government will make no progress in addressing the worsening economic situation, the return of internally-displaced persons to their homes, or the reconstruction of damaged parts of the country. Moreover, the progress of the war against ISIS will be suspended in limbo, as the Iraqi Security Forces (ISF) will be conducting operations for a failed government, and make it far more difficult for the U.S. to conduct anti-ISIS operations. ISW previously assessed that a vote of no-confidence against PM Abadi was the most dangerous rather than the most likely course of action because no compromise candidates exist to take his place. It is still unclear if the political blocs could get behind any political leader. Maliki will not likely be able to form a government because of the degree of animosity other political blocs have towards him. National Alliance chairman Ibrahim al-Jaafari, a close ally of Iran, is the closest thing to a consensus candidate amongst the Shi’a parties, but even he would face serious obstacles as a candidate. These establishment figures remain possible candidates for the premiership only if the political blocs manage to rein in their rebelling CoR members. Time will tell if the rebelling CoR members will coalesce into a functioning political bloc capable of challenging others in the CoR. But the formation of a rump CoR and growing calls for the dissolution of government, in defiance of the wishes of the political bloc leaders, Iran, and the U.S., bode ill for PM Abadi’s ability to remain in office and effective. Political blocs may still put their differences aside and vote to retain confidence in PM Abadi by selecting a new cabinet, but that remains unlikely, as political blocs remain undecided on what the new cabinet should look like. A vote of no-confidence or a constitutional crisis in which the formal, elected parliament no longer functions are more likely scenarios. The U.S. must therefore prepare for the possibility that the post-Abadi Iraq will arrive sooner than expected, with all of the instability that will follow.